The CoComment guys were nice enough to send me an invitation to try the service after my post yesterday. I am now able to answer some of the questions I had in that post. They support six big blogging platforms currently: Blogger, MSN Spaces, MySpace, TypePad, WordPress and Xanga. I’ve tested this on two wordpress blogs and it works perfectly on that platform. They are working to add additonal platforms, and have requested help from the community. The process for leaving a comment is fairly simple and does not require using a separate interface. You leave a comment as usual, and before submitting it you simply press the bookmarklet button. This saves the comment at CoComment. The interface for viewing your comments (image below) is very nice and includes the ability to expand/collapse any set of comments. 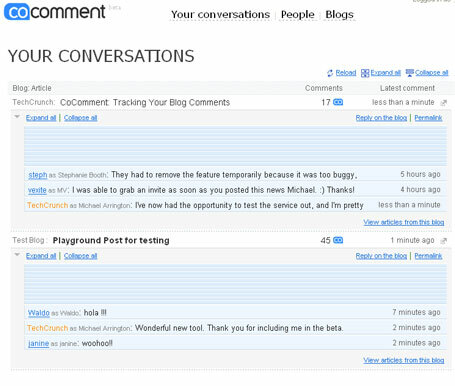 And each user has a RSS and Atom feed of comments they’ve left (this is really useful). While CoComment can do nothing with trackback comments, everything else is rock solid and this is going to be a very popular service.